Discover debauchery during this 2-hour small-group haunted tour, which will cover topics such as adultery, prostitutes, and twisted doctors. Your guide will entertain you with treacherous and spooky stories as you walk from a variety of locations such as The Creole Cookery and May Baily's. Calm your nerves with some liquid courage as this tour combines spirits with spirits at 3 different bars. 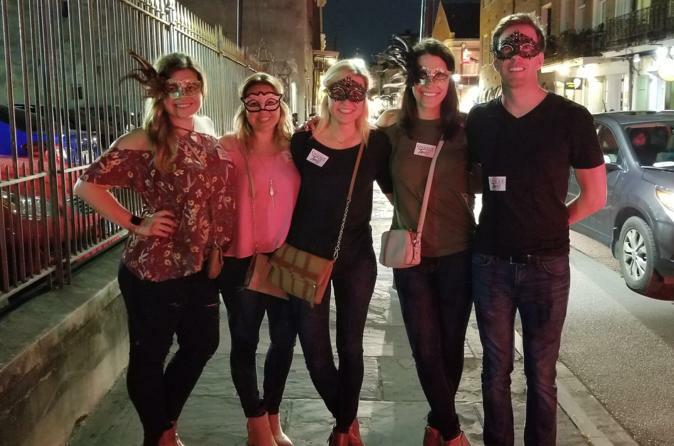 This 21-and-over tour is great for groups who want to experience the twisted side of NOLA. This tour has combined raunchy ghost stories with seedy haunted bars to create two of the most spooky hours of your life. The first story presented starts at a location where spirits and spirits meet, The Creole Cookery. Here is where a tale of adultery ends in murder and everyone involved just won't let it go. With your guide, you will continue on to the first licensed bordello in New Orleans, May Baily's. Here you will meet the madam that still runs the brothel in addition to other spirits that just won't leave. Between every haunted location is a place to grab another drink in the event you are thirsty for even more. Along the way you will discover stories of adulterers, prostitutes, womanizers, and the just plain evil. Their treacherous accounts haven't been forgotten and have left a mark on all of the locations you'll visit. You will learn the history behind the stories and the haunting that still plagues the scenes. Carry your drink along the streets to your next location, while listening to one depraved story after another.